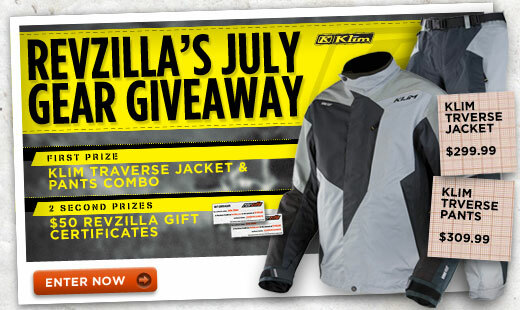 Tilted Horizons: RevZilla's July Gear Giveaway! If you're an enduro, off-road or adventure rider, you need waterproof, precisely-patterned gear. And since you're reading this, you could be in luck thanks to RevZilla. Just spend about 30 seconds creating a Rider Profile on RevZilla's July contest page, than sit back and wait for the monthly winners to be drawn. The First Prize winner this month will receive a Klim Traverse Jacket and Pants combo valued at about $610. Two Second Prize winners will receive $50 Revzilla gift certificates.